Por Claudio Galeno-Ibaceta sobre la interacción del arte con la arquitectura, desde Antofagasta y el Norte Grande de Chile. By Claudio Galeno-Ibaceta about the interaction between art and architecture, from Antofagasta and the Large North of Chile. Vía Fondation Cartier pour l'art contemporain. View of the exhibition Southern Geometries, from Mexico to Patagonia, Fondation Cartier pour l’art contemporain, Paris, 2018. © Solano Benítez and Gloria Cabral. Photo © Thibaut Voisin. 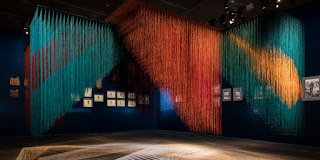 View of the exhibition Southern Geometries, from Mexico to Patagonia, Fondation Cartier pour l’art contemporain, Paris, 2018. © Courtesy of Casa Amaral. La Patinoire Royale - Galerie Valérie Bach, Bruxelles. Photo © Thibaut Voisin. The exhibition opens with a spectacular ballroom designed by the Bolivian-born architect of Aymara origin, Freddy Mamani, whose work is inspired by the geometric motifs characteristic of Tiwanaku culture, as well as by the spirit of Andean village festivals. In his hometown of El Alto, his eye-catching multicolored buildings, which he refers to as “neo-Andean,” stand apart from the ordinary brick architecture of the region and bring contrast to the dull, muted tones of the Altiplano landscape. The facades of his buildings derive their formal vocabulary from Pre-Columbian and Indigenous art, and their bright colors are inspired by Aymara textiles and ceremonial costumes. Inside his buildings, the profusion of geometric patterns and the richly decorated columns mingle with whimsical chandeliers and lamps. 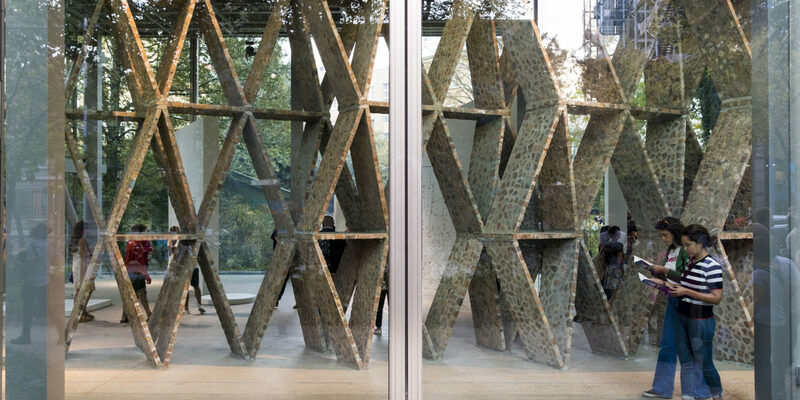 In the neighboring gallery, Paraguayan architects Solano Benítez and Gloria Cabral, winners of the Golden Lion at the Venice Architecture Biennale in 2016, use panels of shattered bricks and concrete to create a monumental work based on the principle of repetition. 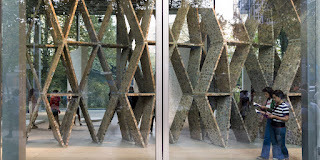 A rhythmic construction that plays with the light coming into the gallery space, this installation, assembled in a delicate equilibrium using a modular system of triangles, runs the length of the facade of the Fondation Cartier building. Presented in the same gallery as Solano Benítez’ architectural tour de force is a remarkable group of 23 intricate wire sculptures by the Venezuelan artist Gego. These works, many of which are on loan from the Fundación Museos Nacionales in Venezuela, have been brought together for the first time in Paris. A major figure of Latin American art, Gego explored throughout her career the infinite possibility of the line in three-dimensional space. Her delicate net-like sculptures have an organic quality that eschews the formal rigor of geometric abstraction. She weaves, bends and twists steel or aluminum wire, taking advantage of its flexibility to create irregular shapes that integrate transparency as a sculptural element. The lower level galleries present more than 220 works from a variety of cultures and time periods, connecting the ancient with the contemporary, modernist art with Amerindian culture.Influenced by both Pre-Columbian and abstract art, the work Madera planos de color by Joaquín Torres García introduces this section of the exhibition. Elsewhere in these galleries, the paintings of Uruguayan artist Carmelo Arden Quin, who launched the Madí Movement, are presented along with the sculptures of the Brazilian Lygia Clark, the photographs of the Mexican Lázaro Blanco, and the paintings of the Argentine Guillermo Kuitca. This exhibition also highlights the work of under-recognized artists, presenting for example a series of large canvases by Carmen Herrera, a pioneer of Cuban minimalism and the photographs of Anna Mariani representing the colorful facades of the houses in north-eastern Brazil and the abstract patterned landscapes of Brazilian Alfredo Volpi. Other works included in this section are inspired by Pre-Columbian art and architecture. Peruvian photographer Martín Chambi photographed Machu Picchu in the 1920s, stimulating a renewed interest in and appreciation of Inca architecture and culture. Mexican photographer Pablo López Luz captures the influence of Inca design in contemporary vernacular architecture. The exhibition also takes a look at the mysterious formal vocabulary of indigenous geometry. These motifs are represented on ceramics, basketry, textiles and the human body, and are combined in many different ways using styles specific to each culture. Numerous works created by the Ishir Indians (or Chamacoco) of Paraguay for their ceremonies and rituals are presented here for the first time in Europe. The contemporary drawings of the Wauja people are exhibited alongside those of the Kadiwéu [Caduveo] whose elaborated face paintings were photographed in the 19th century by Guido Boggiani and in the 20th century by Claude Lévi-Strauss. Major contemporary photographers such as Claudia Andujar and Miguel Rio Branco also take an interest in the artistic expressions of indigenous peoples, capturing in their photographs the Kayapó’s daily practice of body painting. Brazilian artist Luiz Zerbini also shows his fascination for Amerindian culture, combining in his paintings historical portraits with representations of indigenous ceremonies. These works show how a world of ancestral traditions is still alive today. Celebrating contemporary art as well as the art of ancient civilizations, Southern Geometries takes the visitor from Mexico to Patagonia. Breaking free of artistic hierarchies and fostering a dialogue between all creative disciplines, the exhibition highlights the visual relationships that bring together artists, cultures, rites, and symbols. Publicado por Claudio Galeno en 9:29 a.m.
Arquitecto graduado en la Universidad Católica del Norte con el grado de Master y Doctor en Teoría e Historia de la Arquitectura obtenido en la Escuela Técnica Superior de Arquitectura de Barcelona, UPC. Claudio Galeno I. Tema Awesome Inc.. Con tecnología de Blogger.